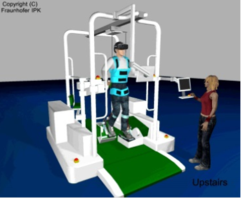 The goal of the subproject module is the development of an integrated end effector-based gait rehabilitation robot system with patient-adaptive "Assist-as-needed„ control procedures and multimodal biofeedback, e.g. haptic, tactile and Virtual Reality for the use with severely affected patients in clinical rehabilitation. The system also provides FES support with hybrid robotics / FES control. It is intended to support the re-learning process of the physiologically correct movement process and additionally stimulate a muscle activation of the patient synchronous to the gait cycle phases. The adaptive robot system with VR Biofeedback and FES is based on a commercial endeffector based gait rehabilitation robot system platform with a standard robot controller including position based path control. The system platform will will reach a new level of quality, which will significantly enhance patient therapy and therapy options in rehab hospitals. The aim of this project is to develop a portable functional electrical stimulation (FES) system. This system supports the patients gait rehabilitation by naturally adapting to the needs of the patient. The main target group are stroke patients undergoing rehabilitation therapy. Especially patients who can already walk on their own, can be driven towards a more physiological gait by targeting specific muscle groups. In order to achieve this, smart algorithms adaptively synchronize the stimulation patterns with the real-time gait phase detection.